Bundled with seventh Blu-ray/DVD volume of Kyoukai no Kanata. Episode 0 happens two years prior to the TV series when the Nase siblings meet Akihito for the first time in a mission for Hiroomi. Mitsuki follows her brother on this mission and their goal is to subjugate Akihito. 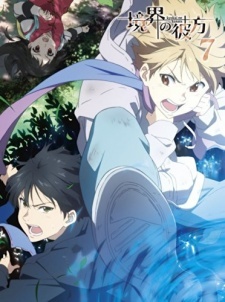 Watch Kyoukai no Kanata Episode 0: Shinonome Episodes Online at Animegg.org. Kyoukai no Kanata Episode 0: Shinonome is available in High Definition only through Animegg.org. Choose an episode below and start watching Kyoukai no Kanata Episode 0: Shinonome in Subbed & Dubbed HD now.